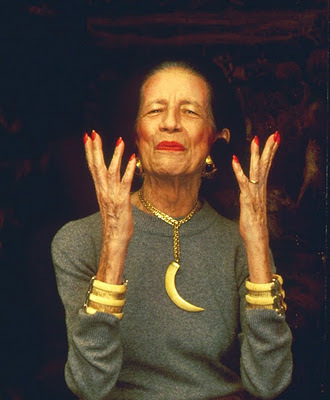 Diana Vreeland film screens at DIFF, Director speaks of what’s to come this fall! Last Tuesday, was the first of two screenings of Diana Vreeland The Eye Has To Travel, which naturally was my center piece screening, if you will, at the 2012 DIFF. Clearly I wasnt the only one who was expressing a certain kind of groupie-ism, as word spread of the film so did the news that first time director, Lisa Immordino Vreeland, was due right here in the city. Our city indeed moved quickly, centering events around this particular film, professors professed all info to fashion students, and just like that, Diana Vreeland The Eye Has To Travel became among the most anticipated films at the DIFF. I was sure to snag tickets to the first screening, which was the ideal intimate setting with fashion enthusiast of old and young and Lisa Immordino Vreeland watching along with us. The Film, which was paired with the book published in october, sharing the same name, also published by Lisa Immordino Vreeland , who to add is the granddaughter-in-law of the Diana Vreeland herself, Talk about fashion history indeed! The film brings the pages of the book right to life, in fact i’m speaking literally, First scenes of the film show each page of the book , and snap shots of Vreeland’s apartment, which is almost just as famous, being modeled after a garden in hell. it’s no question who Diana Vreeland was, and perhaps still is to many. I could go on and on about her legacy, her career, and her fabulous friends but I find watching the film is a lot more pleasurable. The one thing I absolutely loved of the film, is the extraordinary amount of information that at sometimes was dwarfed by Vreeland’s over the top personality. Clips of interviews with Vreeland were cut, snipped, and pasted back to an almost seamless conversation with Vreeland. I was already in a fashion groupie mind-set, but as soon as I saw Diane Sawyer circa 1970-something, the closeted journalist I fancy myself to be ,was in a jaw dropped pose, then hearing Vreeland in the film describe herself as a reported who always has to be ahead of the news, brought me to a complete euphoric state! I have to say, about the most amazing thing about Diana Vreeland was the “First of’s”…such as, technically speaking, she was the first editor of a magazine curating and complying stories, transporting readers of Bazaar and then Vogue, to worlds other than the one they were in. Publishers stated in the film how Vreeland was so criticized for never holding staff meetings, she would send out memo like telegrams of sorts to every staff member providing a plan of action, sound familiar? Clearly Vreeland was the first to use an email approach to business. Diane Von Furstenberg described how these memos were in great but brief detail, letting her staff members in on what she was foreseeing as trend, in all respect Von Furstenberg continues , this could have been perhaps the first fashion blog, amazing! Vreeland also was the first to say, in essence , Character was your greatest accessory. Celebrate the imperfections of oneself, which is the only true thing that sets you apart from everything and everybody else. This was true of Anjelica Huston’s stature, Cher’s gypsy persona, and Barbra Streisand’s nose. All so “superb” according to Vreeland, who put them all in Bazaar. After the film, I felt so taken by everything, I do mean everything, Lisa Immordino Vreeland went on describing the process of the film, the amazing connection she felt during the film. Lisa Immordino Vreeland, started out in the fashion industry with a very successful career as a designer, She felt compelled to publish a book to let the a new generation of fashion elite in on the amazing one of a kind woman Diana was. She soon found out, that the book had to be brought to the big screen. Diana Vreeland’s “Get The Life You Want” attitude towards her own life, is a transcending message, not just for those in fashion, but anyone who ever craved something greater in their own life. An amazing legacy, and message for anyone who dared to have an insecurity. Perhaps the greatest piece of information Lisa Immordino Vreeland gave is that Diana Vreeland The Eye Has To Travel is slated for a national theatrical release come September. So it looks like we are all going to head back to theaters for an encore, Lisa Immordino Vreeland also tipped us on perhaps some new additions in the film may surface. An amazing film, I cant say it enough! This entry was posted in | and tagged bazaar, Dallas International Film Festival, diana vreeland, DIFF, fashion, VOGUE. Bookmark the permalink. ← Marni for H&M hits NorthPark Center, Rules and Regulations Apply. So mad I missed this! Diane Vreeland has some great fashion quotes,I know her documentary was amazing! A full critique: One word, nuts’. This is obvlousiy out to appeal to two kinds of viewers. One, emo-jokers looking for a laugh, or two, hormonal young men with a goth/lez fetish. Silly plot balance aside, fairly well-filmed, not properly audio-fixed, but good for a home production. Lisa did a good job on cosmetics, hair, and costuming (though the character role was obvlousiy not something that needed a lot of effort). Diana did the supporting act well. Audio track well-chosen.